We recently received a three-part series of articles written by Michael Johnston, a Grand Rapids labor historian and former journalist with Grand Valley Labor News (GVLN). This recently acquired three-part series is important, since he provides important analysis about co-founders Rich DeVos & Jay Van Andel. The GVLN series is also important because it looks at the anti-labor practices of the Ada-based corporation in the late 1960 and early 1970s. 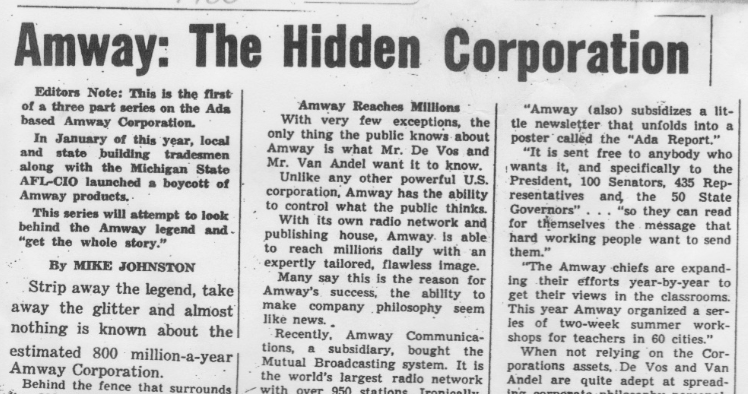 Part I of the series provides more of an overview of the Amway Corporation and its co-founders DeVos and Van Andel. One thing important from Part I in the series is the information about how much media the Amway corporation produces and owns, both in the United States and around the world. 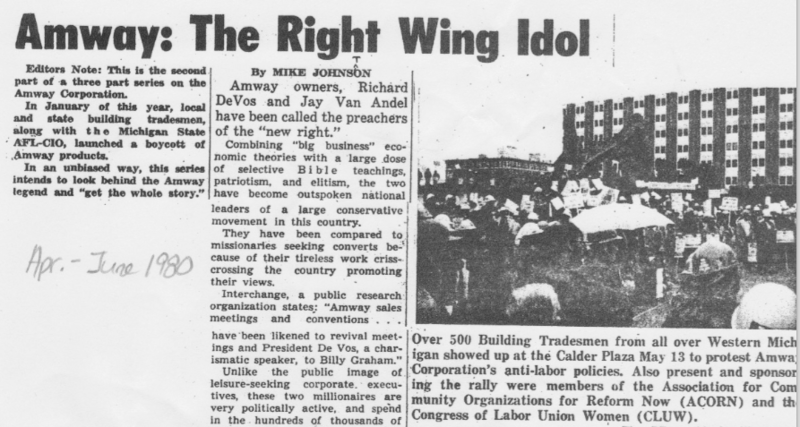 In Part II of the series, entitled, The Right Wing Idol, Johnston takes a look at theideological worldview of the Amway co-founders and provides details on who these two members of the capitalist class were funding at the time. This investigation into which organizations DeVos and Van Andel were funding is similar to our post from another source in the late 1990s. It is important to have some comparisons in different decades to see how their contributions to Right Wing entities had evolved. In addition, the picture that accompanies Part II in this series (see above), is from May of 1980, where some 500 people were in Calder Plaza to protest Amway’s anti-labor practices. Most of those protesting were from various trade unions, but there were also representatives from ACORN – the Association for Community Organizing for Reform Now. 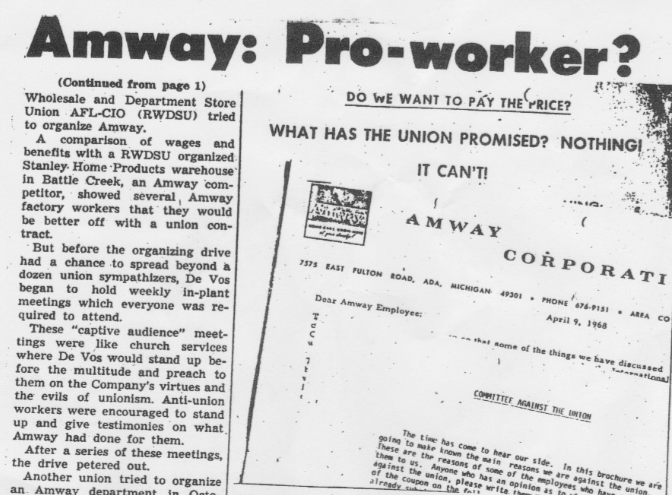 In Part III of the series, the writer takes a close look at Amway’s anti-union position, beginning with examples from the 1960s, when the Retail Wholesale and Department Store Union (part of the AFL-CIO) attempted to unionize the Amway plant in Ada. This story is particularly interesting since it discusses how Rich DeVos began holding mandatory in plant meetings to counter the union efforts. Part III devotes a fair amount of attention to this dynamic, since DeVos has made this practice of regular meetings with employees an important part of his strategy to undermine workers who attempt to create a union within the company founded on a pyramid scheme. This entry was posted in Anti-Capitalism/Labor, Indy Media and tagged Amway anti-labor practices, Amway corporation, Grand Valley Labor News series on Amway, Michael Johnston, Rich DeVos and Jay Van Andel. Bookmark the permalink.